The Best Norwich Blogs from thousands of Norwich blogs on the web using search and social metrics. Subscribe to these websites because they are actively working to educate, inspire, and empower their readers with frequent updates and high-quality information. Norwich newsletter is a comprehensive summary of the day's most important blog posts and news articles from the best Norwich websites on the web, and delivered to your email inbox each morning. To subscribe, simply provide us with your email address. Norwich, England About Blog Norwich Evening News keeps you up to date with all the latest information and news about sports and entertainment and much more around Norwich. Facebook fans 25,346. Twitter followers 58,901. Norwich, England About Blog The Fry up Inspector Blog gives details and reviews about cafes and their breakfast, Street Food and shares their travel experiences. Facebook fans 9,772. Twitter followers 2,109. Norwich About Blog My Football Writer provides you with the latest news, comment and analysis from Norwich City Football Club. The team of professional football writers will not only bring you the breaking stories as they happen, but you’ll also get their regular columns on all things of Norwich City. Facebook fans 137. Twitter followers 2,513. Norwich, England About Blog Love Norwich Food promotes Norwich Independent Food, Cookery School, Recipes, Mystery Diner, Food Tours, a local directory in Norwich. It is a one stop destination for all food and drink of Norwich at one place. Norwich, Norfolk, UK About Blog Enjoy Norwich is independent resource providing information & inspiration about Norwich, including the cream of Norwich's restaurants, hotels, shops, pubs and bars and proves to be an inspiring, indispensable guide. Facebook fans 4,390. Twitter followers 25,464. Norwich About Blog Oyster Travel is an independent Norwich Travel Agent, offering flexible and wide range of professional travel services to meet the clients exact needs. Their mission is to offer unrivaled savings at a selection of hand-picked luxurious destinations, creating unforgettable holidays at affordable prices. Facebook fans 2,730. Twitter followers 438. Norwich, UK About Blog Norwich Theatre Royal features the best shows from big musicals to great dramas, alongside dance, comedy, family shows, opera and music. It is an educational charity, working with thousands of local young people each year across training courses in theatre skills, educational visits and workshops, and works with the wider community as well. Facebook fans 22,920. Twitter followers 18,347. Norwich, England, UK About Blog Landlord Law Blog is an online information service site which has interesting articles, news and tips on residential landlord & tenant law and practice. It help landlords and tenants understand their legal rights and obligations. Facebook fans 2,817. Twitter followers 6,209. Norwich, UK About Blog Lipstick, Lettuce & Lycra is a Women’s Lifestyle blog with covering vintage, fashion, fitness, food, travel and lifestyle issues. It helps you bringing a touch of vintage glamour to a modern life. Facebook fans 2,103. Twitter followers 12,693. Norwich About Blog Thou Shalt Not Covet is a fashion and beauty blog dedicated to Michelle's, the author, obsession with beautiful things, from fashion and make-up, to interiors and lifestyle. She also includes product reviews, vintage finds and looks, and anything else she wants to share with the world. Facebook fans 5,622. Twitter followers 17,299. Norwich, UK About Blog Official Norwich Airport website provide details about flight arrivals and departures, car park booking, passenger information, destination list, news and special offers. Facebook fans 3,755. Twitter followers n/a. Norwich About Blog Sophie, a 27 year old Norwich girl keeps us updated with fashion, lifestyle, travel. Sophar So Good provides information on fashion, life, food, travel and beauty and many more. Facebook fans 10. Twitter followers 1,826. Norwich About Blog The Fabulous Miss K is a super stylist and personal shopper with 25 years of experience, specialised in Vintage, lifestyle consultant, event manager, blogger and vintage veteran. KAREN JAMES-WELTON has a wealth of knowledge and believes Vintage is for Everyone. Facebook fans 1,282. Twitter followers 1,024. Norwich About Blog Norwich Business School aspires to be a leading international business school in Norwich at the forefront of business and management education and research, admired for its advocacy of responsible business, and distinguished by its passion to 'do different' and to make a difference for the benefit of its students, staff and the communities it serves. Facebook fans 3,653. Twitter followers 3,049. San Francisco, CA About Blog This subreddit discusses everything about Norwich which lets you easily talk to friends, view live stories and explore news. Facebook fans 1,197,357. Twitter followers 561,208. Norwich About Blog The Hawk and Owl Trust work hard to promote the conservation of birds of prey and importantly their habitats and linking up with schools and the wider community is big part of their work. Facebook fans 13,376. Twitter followers 23,598. Norwich, England About Blog Carly Rowena is a Personal Trainer & Fitness YouTuber which trains you to give the body you want without spending your life in the gym or having to avoid the foods you enjoy. Facebook fans 25,098. Twitter followers 50,072. Norwich About Blog Julian knew well that “God is love”. In her mystical theology, she will carry that truth to its fullest implication that God cannot stop loving us because that’s who God is. Norwich,England About Blog Norfolk Brides wedding blog features an abundance of Real Weddings and Styled Photoshoots. Find some wedding planning tips along with an exhaustive wedding directory to help you plan your wedding. Facebook fans 7,035. Twitter followers 6,032. Norwich About Blog Norwich Bookstore is a locally owned and independent bookstore in the heart of Norwich, since 1994. It offers creative note cards and gift wraps; traditional and unique toys and games; and other treasures; special attention to special orders; frequent author readings and book signings. Facebook fans 1,107. Twitter followers 350. Norwich, England About Blog GGS is a design led creative design agency providing a wide range of creative products and services to all the clients. This includes commercial photography, graphic design, large format digital printing and exhibition and display equipment. GGS pride themselves in offering the complete solution to the business needs. Facebook fans 442. Twitter followers 1,050. Norwich About Blog CrossFit Spitfire in Norwich is a fully equipped gym with dedicated, qualified coaches. This Blog gives full body different workout programmes for kids and for any age & ability. The unique exercises and workouts are scalable to suit each individual and their own personal goals. CrossFit community brings together a wide range of people from beginners who are new to fitness and the elite athletes who are looking for a new challenge, both body and mind. Facebook fans 3,236. Twitter followers 224. Norwich, UK About Blog Shelley Beth, a Norwich based lifestyle blogger writes about life, fashion, food, beauty and travel and many such things. One will find heaps of passionate posts about fashion and beauty with a sprinkling of culinary adventures and a whole new outlook on life. Facebook fans 50. Twitter followers 1,391. About Blog I'm Turkish Cypriot, moved to London when I was nearly 5 years old. Growing up in London was exciting. But coming from a different culture presented its own difficulties. Don't get me wrong experiencing more than one way of living is great. But those boxes people wanted to put you in and label had begun at only 18! Norwich, England About Blog I'm Taylor aka TWUSS an Interiors & Lifestyle blogger with a weird obsession for furniture. With a love of hospitality interiors, home interiors, fashion and lifestyle, I wish to inspire people with the beauty of design and let others see the world through my eyes. Facebook fans 1,285. Twitter followers 811. Norwich About Blog Patrick Watson is a romantic, beautiful Wedding Photography In Norwich. He gives you a collection of images in a mixture of colour and timeless black and white that take you straight back to your wedding day every time you look at them, some things just never change. Norwich About Blog Norwich Labour purpose is to further the ideals of socialism both locally and nationally, primarily by getting two MPs elected to Parliament and also as many Labour City, County and District councillors elected as possible. If you would like a more equal, socially just, aspirational world:COME AND JOIN THEM! Facebook fans 1,298. Twitter followers 3,405. Norwich, England About Blog Tramp Menswear, a menswear UK brand specialized in delivering stylish casual wear and modern prints in luxury menswear. The fresh designs have a soft touch to create a luxury feel. Tramp is committed to using high quality fabrics and will continue to deliver excellence throughout their designs. Facebook fans 1,037. Twitter followers 77. Norwich, England About Blog Wears Rosie, a 25 year old fashion follower, gin lover and cat mother is living and blogging in Norwich. She is a fan of fast fashion, interior design and eating out, so expect this space to be filled with a whole lot of that, along with a the odd beauty post or two. Norwich About Blog Chris Bottrell style is traditional, but with all the values of modern classical that can be seen throughout his work, be it pictures taken for weddings or portraits. The end results are guaranteed to make eyes gleam with joy at the beautiful and personal potrait of ones own story. Facebook fans 5,317. Twitter followers 338. Norwich About Blog Agile Property Partners is a specialist UK property investment company based in Norwich. They offer successful development and property investment opportunities to clients with an interest in residential and commercial property investing. They find the best finance deals, manage the legal process and arrange the management of property for their investor partners. Facebook fans 193. Twitter followers 2,113. Norwich About Blog Martin Giddings is a Norwich wedding photographer offering candids, natural and dramatic wedding photographs. He supplies with a beautiful set of images that will bring back all the memories from the wedding day. Norwich, England About Blog Sir Toby’s Beers aims to be the principle provider of specialist Micro-brewed Real Ales & Craft Beers sourced from small, experienced breweries in Norwich and surrounding areas. Facebook fans 1,065. Twitter followers 957. 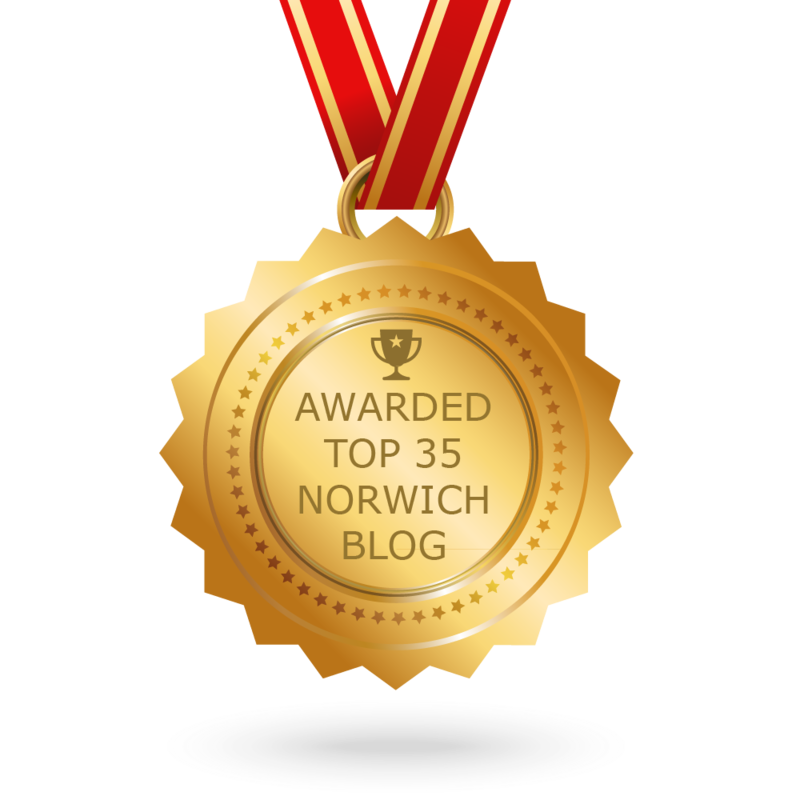 CONGRATULATIONS to every blogger that has made this Top Norwich Blogs list! This is the most comprehensive list of best Norwich blogs on the internet and I’m honoured to have you as part of this! I personally give you a high-five and want to thank you for your contribution to this world.